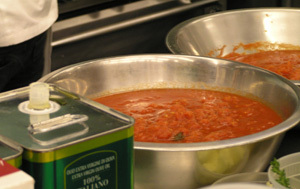 Pasta sauce, a simple but also elegant companion to your choice of pasta, and especially when the sauce is created by Executive Chef Missy Robbins of A Voce as part of the New York Culinary Experience hosted by New York magazine and The International Culinary Center. 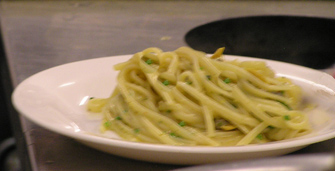 Sometimes over simplified, and sometimes over complicated, pasta sauces are created in the image and likeness [to the taste] of the person who is creating them. 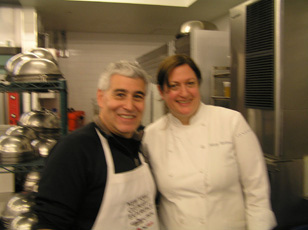 There is no right way, or wrong way, but when you can learn by the side of one of New York's brightest Italian Chefs, Chef Missy Robbins, I had to sign up for this unique opportunity. 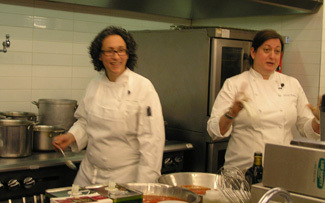 The 2-hour hands-on class was held on April 28, 2012 as part of the New York Culinary Experience at The International Culinary Center. Chef Robbins and her Chef de Cuisine Hillary Sterling started the session with a brief discussion on the ingredients and how they selected their key ingredients, such as tomatoes and oil. With honed palettes, they explained how they continue to sample new products as they are always looking for the best ingredients for their customers. Chef Missy Robbins, almost a graduate of Georgetown University in Law, started her culinary journey through a part-time job in a restaurant in Washington, DC. Her culinary journey has taken her from Washington, to New York, to Northern Italy, to Chicago, back to New York, before landing at A Voce in New York and being named one of Food & Wine's Best New Chefs in 2010; not a bad journey, and with a great ending. Cooking with Chef Robbins and Chef de Cuisine Hillary Sterling was much more than just fun, it was educational with respect to techniques. We hand squished our tomatoes, cut up our garlic, and later on in the recipe, we processed the cooked tomatoes, spices, olive oil, and garlic through a food mill where they then bottled our labor of love so we could take it home to enjoy at a later time, and I did - yum! Method for the Clams: Heat a large pot or pan over medium heat. Add the olive oil. Add the garlic until it is aromatic and add the clams. Add the white wine, chilies, and thyme. Turn the heat back up and cover the pan. Steam until the shells of the clams just begin to open. Remove the clams from the pan and set aside to cool. Strain the liquid in the pan and reserve. When the clams are cool, remove all the meat from the shells. Clean off the end with the dirt and discard. Reserve everything else and cut the clams on a bias about an 1/8 of an inch thick. Set aside. To Finish the Sauce: Heat the oil in a pan on low and heat and add garlic to sweat slowly, until you can smell it but it has no color. Add the white wine and reduce by half. Add the clam liquor followed by the clams, cooking just to warm through. Finish the sauce with the butter, lemon zest, lemon juice, parsley, and chilies. Use immediately. Method: Bring a large pot of water to boil and add salt. Have a large bowl of ice water set aside. Quickly cook the parsley and the ramps separately in the water until just wilted. Shock both in the ice water. Place the cooked ramp tops and the parsley in a blender with a touch of water to purée. Once puréed add the olive oil. Remove the purée from the blender and place in a bowl. Stir in the almonds and cheese, season to taste with salt, and set aside. Method: Very slowly reduce cream until it is about ¾ reduced and thickened. In the meantime, grate the fontina cheese on a large side of a box grater. When the cream is reduced, gradually begin to whisk the cheese into the cream. Continue whisking until all of the cheese is melted into the cream and dissolved. 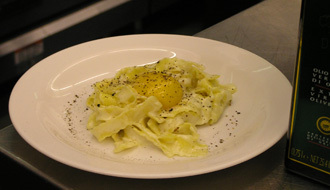 Whisk in the egg and season with salt and pepper. Set aside in a warm place. Method: In a heavy bottomed saucepan on low heat put in the olive oil and whole garlic cloves. Cook very gently on low heat until they are golden brown and tender. You will need to stir it occasionally to get color on all sides. 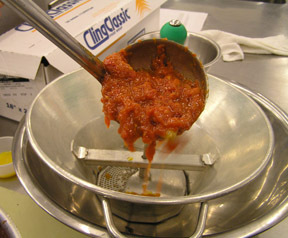 While the garlic is cooking drain the tomatoes from their liquid and crush with your hands, reserving some of the juice. Once the garlic cloves are golden and soft, add the tomatoes and ½ of the juice. Add the spices. Let simmer for 1 hour. In the last 20 minutes, add the basil. Remove from heat. Pass through a food mill. Season to taste with salt. Read about Chef Missy Robbins' class in the Gastronomy section. Read about the New York Culinary Experience and the classes we attended in the Gastronomy section, and interviews and recipes from the classes in the Chefs' Recipes section. To attend the New York Culinary Experience 2013, please visit the New York magazine website: www.NYmag.com/nyce. Regarding taking classes throughout the year with the excellent chef instructors at The International Culinary Center at their New York, California, or Italian Campuses, please visit the website: www.InternationalCulinaryCenter.com. © May 2012. Luxury Experience. www.LuxuryExperience.com. All rights reserved.